Built for precision, efficiency and complete driver satisfaction, the head-turning 2016 Hyundai Veloster in Dallas speeds into a new model year with major performance, design and connectivity upgrades along with an all-new Rally Edition model. A unique hatchback with plenty of convenient features, the Veloster is built for contemporary drivers seeking accessible technology and top-notch fuel economy with a sporty twist. A feature that our 2016 Hyundai Veloster review especially loves is the hidden third door that makes entry to the second row incredibly convenient. Long ago are the days when you had to awkwardly wiggle into the back seat of a coupe thanks to the ingenious secret entryway located behind the passenger door. Offering convenient entry with the same sleek coupe appearance, this sporty hatchback is a no-brainer for Dallas area drivers. The convenience doesn't stop there, though. Standard with a seven-inch touchscreen display, the Veloster propels forward with new features including HD radio accessibility, "Eyes Free" Apple Siri integration for iPhone users, integrated Pandora internet radio and an integrated RCA cable for video game connectivity. Previously available in a standard Veloster, Turbo or Turbo R-Spec models, the revised hatchback debuts an exclusive Rally Edition in 2016 that serves as an extension of the sporty R-Spec. 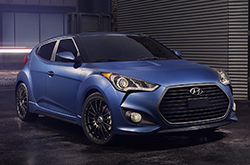 Featuring high-performance-tuned springs, dampers and handling, the Rally Edition Veloster comes in a Matte Blue exterior that is aerodynamically optimized for an athletic experience. Under the hood, the Rally Edition, along with the Turbo and Turbo R-Spec models, is powered by a 1.6L direct-inject four-cylinder that hustles to provide a capable 201 horsepower and 195 lb.-ft. of torque and still offers an astounding combined 29 mpg. Mobilizing the standard Veloster is a 1.6L four-cylinder that uses direct injection to achieve a peak output of 132 horsepower and an impressive fuel economy estimated at 31 combined mpg. While our 2016 Hyundai Veloster review recommends the Turbo engine for performance lovers, the standard 1.6L is a clear choice for drivers seeking exceptional fuel efficiency for lengthy commutes. A contemporary choice loaded with next-generation technology, the sporty Veloster proves its worth as an able hatchback. 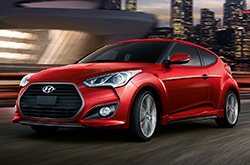 Available today, the 2016 Hyundai Veloster in Dallas is a high-quality choice you'll love to call your own. The 2016 Ford Focus, Volkswagen Golf, Mini Cooper S and the Volkswagen Scirocco are exceeded by the 2016 Veloster in a multitude areas. 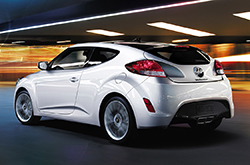 Shoppers will enjoy the Veloster's bargain pricing, as well as its tasteful styling. 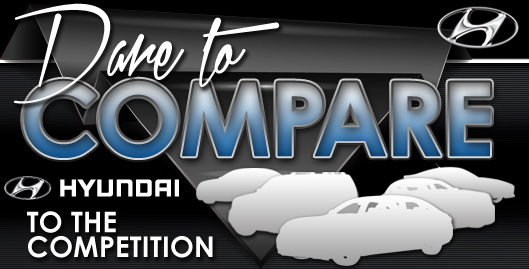 Hundreds of Carrollton Hyundai drivers choose it because it's a remarkable value; just compare its price to the aforementioned vehicles. Look through our Quick List below this text to find out more! Welcome to the Van Hyundai review of the new Veloster. After reading our overview above, if you decide the Veloster isn't the ideal vehicle for your needs and budget, please check out other 2016 Hyundai reviews in our research gallery. As the premier Hyundai dealership in Carrollton it is our mission to outfit our customers with reviews authored by the top Hyundai writers around. Filled with worthwhile information and specs, including safety features and other info, each overview gives you full access to everything Hyundai's lineup has to offer. Discover more about our incredible series of vehicles; visit the research index to review and compare other models from Van Hyundai now!